As a family we had the good fortune of visiting the magnificent Yosemite National Park last summer. Yosemite is a place like no other, and even though we had heard tales of the beauty we would see there, we were all totally amazed to witness for ourselves what is a remarkable and spectacular landscape. Sam just graduated from high school, and when asked what he would like for a present, he was pretty emphatic in his desire to travel west to see Yosemite again. When we left the park last summer I think we each had the feeling we would be back, but little did we know it would be so soon. Last summer we spent the majority of our time in Yosemite Valley enjoying the icons – and the crowds. We had a wonderful time exploring along the Merced River and bending our necks to soak in views like Yosemite Falls, Half Dome, Bridalveil Falls and El Capitan, but all the while there we couldn’t help wondering what it would be like to escape the hordes of tourists and get up into the high country… this time we will. On this trip we are incredibly excited to be spending most of our time up along the Tioga Road and especially around the Tuolumne Meadows area. At 8,500 feet, the temperatures at this elevation should be moderate and bearable, but it is the promise of experiencing the higher sierra that has us really anticipating our visit. The image above with Half Dome standing large in front of Clouds Rest was made on a perfect summer evening from Glacier Point. 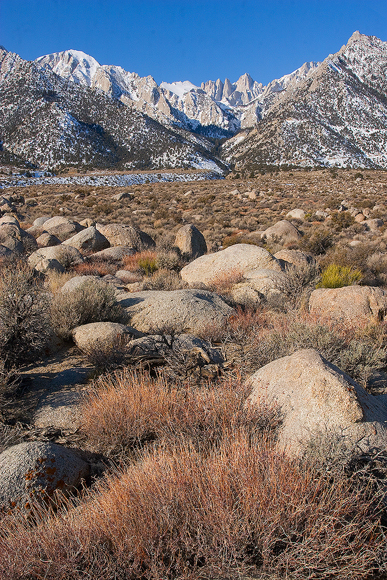 Looking back up Tenaya Canyon toward the high country, you can’t help but sense the wonder of what must be a spectacular and unparalleled wilderness. Can’t wait to see it for ourselves. We are currently researching and planning how we can squeeze every last ounce of Yosemite into our trip, so if you know of any must-see hikes to add to our itinerary, please share in the comments. OK… when I check the road conditions at the NPS web site that are updated every other day or so it would appear that the winter storms that reached into Death Valley in recent weeks have had a more serious impact on the landscape than I initially thought. Many of the backcountry roads are still closed due to either snow and ice, or debris and mud from flood damage – bummer. What if the situation isn’t more stabilized by the time we are scheduled to arrive? A big part of why we chose to visit Death Valley was to experience the power and vastness of the largest national park in the US… that and the possibility of some weather that is warmer than we are getting these days in Maine! If we are restricted to major roads and cannot get to some of the more remote locations we had planned on visiting we will be disappointed, but I realize that we will still be able to see amazing sights, and am sure that we would thoroughly enjoy visiting many of the iconic and more frequented locations in the park that would be available to us. 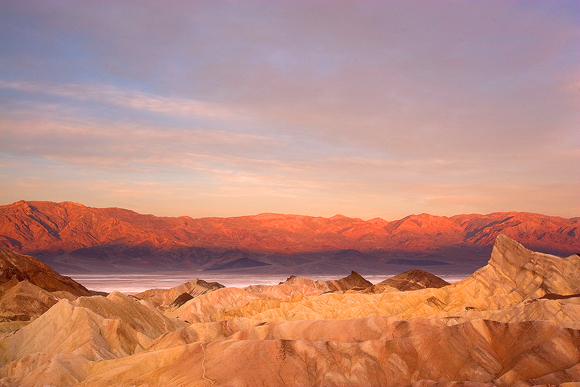 The image above is from one of those icons – Zabriskie Point. 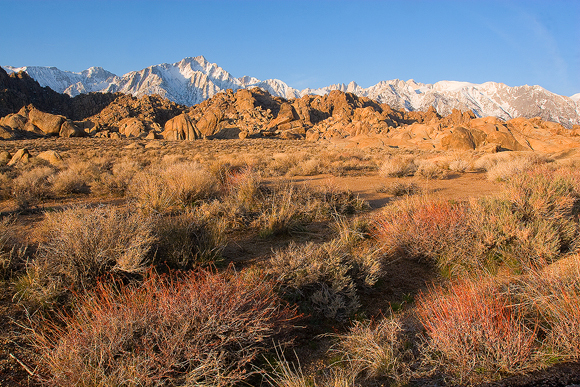 The early morning light had climbed over my left shoulder to warm the distant Panamint Range. After I made this image, the light quickly stretched across the valley floor, chasing the shadows toward me and lighting up the weathered and crumpled folds in the foreground. I intentionally composed this photograph with the dominant expanse of sky to try to accentuate the scale and immense size of this place. Though it looks like I might be in a place devoid of other humans, there were about 50 other people enjoying this beautiful scene with me… some of them photographers, and many of them conveniently deposited here from a luxury tour bus. Despite the crowds… a spectacular place that everyone should witness at some point in their life. We will be keeping a close eye on the conditions and hoping that no more moisture makes it to Death Valley in the next week or so, and as we get closer to our departure date we will be considering three possible scenarios. Plan A is to stick to the plan hoping that everything gets back to normal in time for our arrival. Plan B is to forge ahead even if some of the more remote places are still inaccessible. If we can’t get to places like The Racetrack, or some of the higher elevations, we can still experience the park in most of its glory through the more often visited iconic locations. Who knows, the rains might even offer a fresh perspective on the desert. 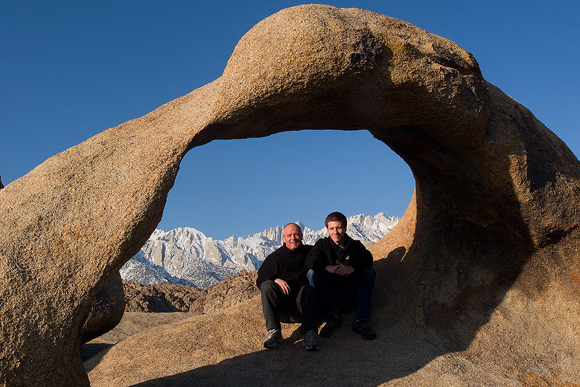 We might also make a side trip over to 395 and the Owens Valley to see some of the sights there. Plan C is if things don’t look so good in Death Valley to make a right turn out of Vegas and instead of going toward California, head over toward northern Arizona and southeastern Utah where will be able to find some different, but nonetheless spectacular scenery and landscapes.